Youth of Honor (YOH) Organization was established to assist troubled and 'at-risk' youth turn their lives around to achieve personal success in life. We view every young person as 'at risk' due to the challenges and key decisions they need to make every day. We will accomplish this through the following programs. Each one is designed to enable our youth to attain the skills required to build personal self-worth and success. Every youth has potential within them to achieve great things. We just have to take time to look below the surface and foster its growth. Partner with local juvenile detention centers and juvenile courts to speak to troubled youth on the dark spiral that they are in. Provide them with hope and real-life examples of how the building of some simple values within their lives can assist them in understanding it is not the 'end of the road' but instead to make it a 'bend in the road'. Provide troubled youth with books and educational materials to assist them in learning how lifestyle changes made today can change, and maybe even save their lives. Hold interactive learning sessions with the youth on abstinence from negative influences in life (e.g. drugs, crime, violence). On a daily basis, youth today face choices that challenge them to make the right decision. Peer pressure moves them while the internet brings new challenges that other generations have not faced before. The Youth of Honor team created the 'Be A Giant' program to help kids understand that they can stand up and make good decisions. The youth are inspired to be giants at home, in the classroom, with their friends, in the community and to our environment through interactive discussions and real life examples. Learn more about this opportunity to make a difference at our Be A Giant page. 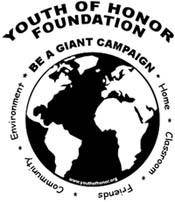 Youth of Honor Foundation is creating its own educational material covering 10 facets of life. After successfully completing the program youth will receive a certificate of achievement and have a toolbox of skills that will assist them achieve in life. The intent of the program is to not only build the youth's self value but also assist them in valuing life on a daily basis. It will hold them accountable for their actions while making a commitment to assisting others succeed in life. We believe that life is a team sport where we are all collectively contributors to each others success - not competitors. This program will eventually be included as a part of this website where youth from around the world can take it in a virtual setting at their own pace as an alternative option to attending an instructor led session. Through a partnership with various celebrities the Youth of Honor team will create and publish short video and audio segments to assist youth in learning life lessons from icons they recognize every day. Life brings many challenges to today's youth but these are experiences that have been seen and overcome before. Through short interviews, the Youth of Honor team will assist youth in realizing they too can overcome and see a better tomorrow by having role models in entertainment, sports and the board room speak directly to them. Inpirational messages will be captured and made available to download into your portable music player or personal computer so you can listen and re-listen to these words of encouragement at any time. YOH Casts will be made available in both video and MP3 formats. Parents, teachers and coaches work daily to keep our youth on the right path but sometimes a few words from someone else can resonate and have additional impacts. YOH Casts were established to bring that other voice to our youth.